← Thursday Travel: Go, Dog. Go! 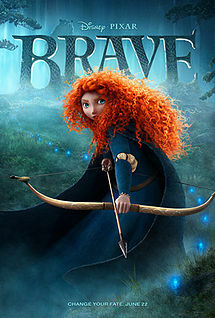 “Brave” is an age-appropriate gem. The heroine is a redhead. The heroine’s success is not self-aggrandizing. Again, in so many kid’s movies, the theme runs roughly along the lines of (1) go against what your parents tell you is good/safe, (2) chase who you are no matter how much trouble/danger this puts your friends in, and (3) assert yourself in order to get your happy ending.” (“The Lion King,” “The Road to El Dorado,” even “Pinocchio.”) This is not only a tedious plot-line, but it is terrible advice for life. In “Brave,” the heroine’s final triumph does not come from being a brat that wins but rather, her journey is one from relative self-centeredness to valuing others and working for peace. Now, as an adult and an author, yes, I thought the plot stopped a little short of having a satisfying complexity. However, I was not the target audience. Nor should I have been. So, kudos to Pixar for creating a kid’s movie that really is for kids. 4 Responses to Monday Media: Bravely done! I saw it this weekend with both my kids and we all loved it. Very thoughtful break down! I really, really, really want to see Brave. (If only because I fully agree with #1.) So glad you liked it! I thought of you when I posted about this for just that reason! 🙂 You should totally go see it.